As I watched last week`s CNBC interview with Stephanie Kelton, I became increasingly convinced that 2021 could see a great experiment in MMT. In that case, the market hiccup of late 1998 could serve as a template for the recent hiccup of late 2018. In that case, the best is yet to come! Stephanie Kelton is one of the leading academic proponents of Modern Monetary Theory (MMT). I wrote about MMT before, so I won’t repeat myself (see Peering into 2020 and beyond). MMT postulates that a government which borrows in its own currency is only constrained by the inflationary effects of excessive debt, and until it hits that point, a government does not have to worry about deficits (for further background, see this Barron’s interview with Stephanie Kelton). There are a number of myths about MMT. It does not mean that deficits doesn’t matter, deficits don’t matter until the bond market decides it matters. There is no free lunch. It does not mean that government doesn’t have to tax. Taxes are and remain a tool of fiscal policy. It is not Keynesian economics. Keynes believed that governments should try run deficits in bad times and surpluses in good times. MMT says that debt, by itself, is not a constraining factor. Stimulus will occur, regardless of who wins the 2020 election. Fiscal stimulus will be reflationary and equity bullish. I have no idea if the implementation of MMT will be a boon, or if Kelton will become the Arthur Laffer of the Left. The bill will be payable much later. In the meantime, investors should be prepared to party. If the results were to turn out to be catastrophic, investors can then opportunistically position themselves to profit from the cleanup. I wrote about the demographic effects of the aging millennial generation could have on investment flows (see Demographics isn’t destiny = History rhymes), but that analysis only focused on investment demand. It is clear from age demographics that a new age cohort is going to have an outsized effect on America, and in many dimensions. One of those dimensions is politics. 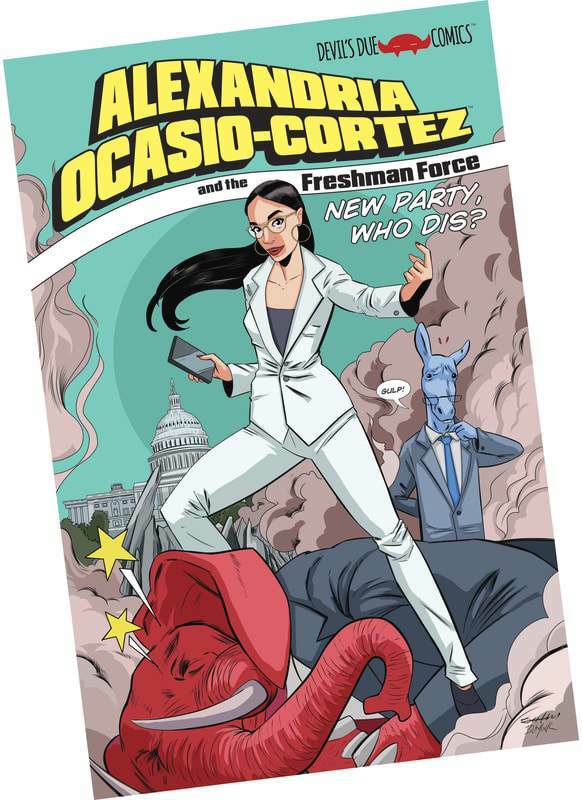 The rising young star of the Democrats is Alexandria Ocasio-Cortez (AOC), and she is already the main character of a comic book that features her as the new super-hero. AOC has championed an ambitious program called the Green New Deal (GND) featuring an array of programs to fight climate change, and other popular progressive initiatives such as medicare for all, and free college. 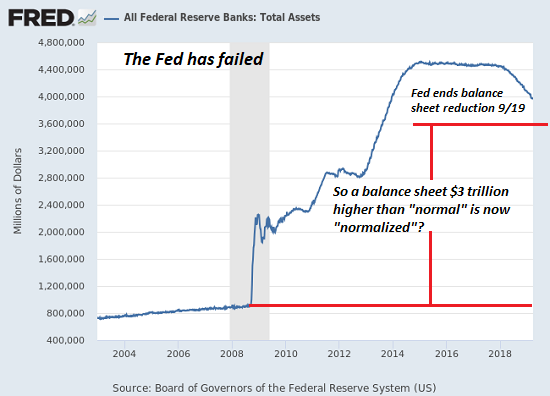 All of this will be financed by MMT. 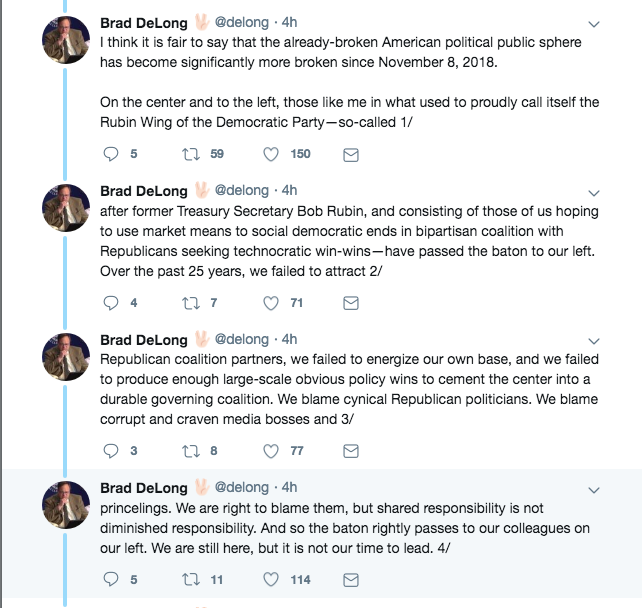 Former Bill Clinton economic advisor Brad DeLong implicitly recognized the rise of the millennials, and concede that his own time had passed. I don’t know how far the progressives within the Democratic Party will get, but their ambitious agenda is likely to push the Overton Window, or the range of acceptable political discourse, to the left. The Overton Window had been drifting to the right for a generation, and some mean reversion is to be expected. 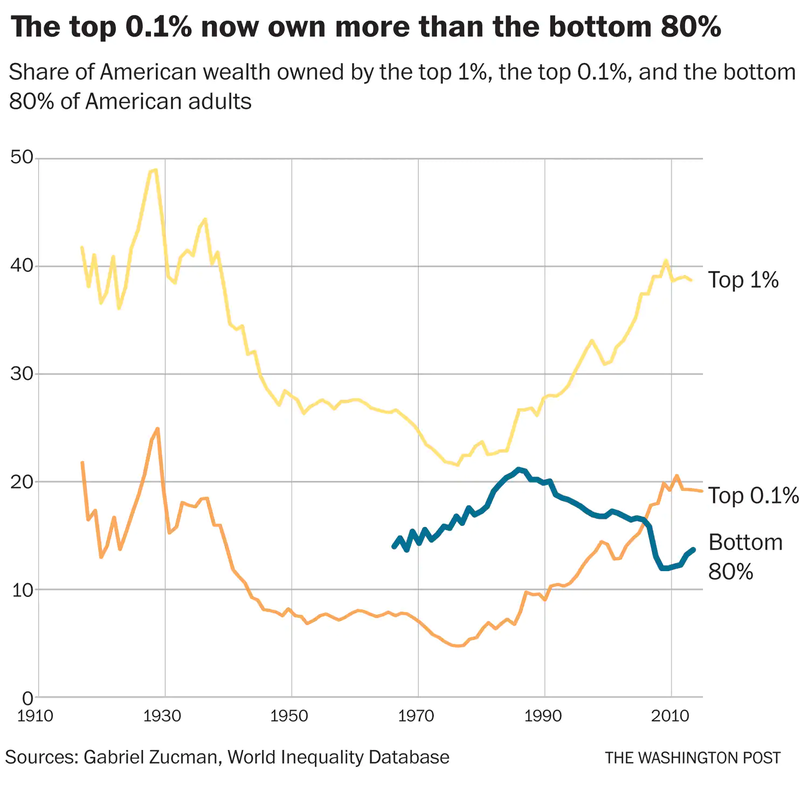 A recent academic paper by Gabriel Zucman found that wealth inequality is at levels last seen during the last Gilded Age, before the Great Depression. Mr. Blanchard, the former I.M.F. chief economist, emphasizes that interest rates are comfortably below the rate at which the economy is growing. 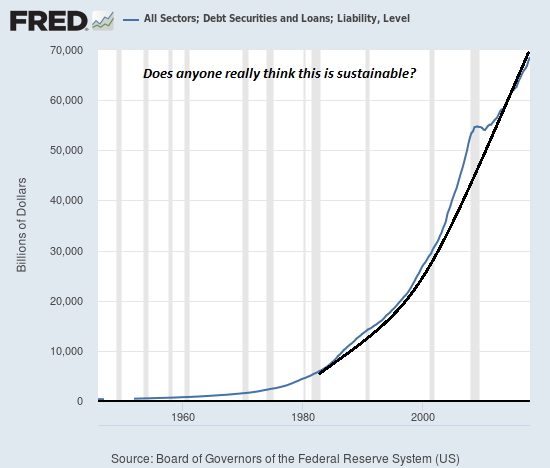 That means that, despite high debt levels in the United States, it shouldn’t matter if the nation keeps borrowing money because its capacity to pay is growing faster than interest costs. Germany’s debt constraint amendment, introduced in 2009 and known as the “debt brake”, sets a tight limit on structural deficits and only permits exceptions in natural disasters or severe recessions. It’s been sacrosanct, with even the powerful International Monetary Fund not daring to question the rule, at least not in public, even though IMF experts regularly exhort the German government to invest more and abandon its strict balanced-budget policy. But an open debate about its merits has erupted, and it’s been triggered not by Anglo-Saxon economists long critical of German austerity but by German economist Michael Hüther, the head of the industry-friendly IW German Economic Institute. Hüther told Handelsblatt that the debt brake has turned into an obstacle to tax cuts and investment. “We’ve walled ourselves in,” he said. The amendment served its purpose and exerted budget discipline on governments, he said. But it’s gone too far, and now bedeviling debt at a time of low interest rates and a huge need for public investment is bad policy. The IMF has pointed out that in the current low-interest environment, debt-funded investments end up paying for themselves because they increase Germany’s potential growth. So what should be done? Hüther of the IW proposed having a special budget just for investment. Fratzscher of the DIW said the debt brake should be replaced by a rule that links spending to economic performance. “In addition, the government should introduce an investment rule that makes sure the state doesn’t squander public assets and instead invests enough in public infrastructure,” he said. Indeed, Bloomberg reported that Germany is turning to fiscal stimulus in the face of continuing budget surpluses. Brad Setser of the Council on Foreign Relations pointed out that if Germany were to run stimulus of 0.3% to 0.4% of GDP for the next 4 or 5 years, its budget surplus would disappear. Finance Minister Olaf Scholz has set aside more than 150 billion euros ($170 billion) for infrastructure, education, housing and digital technology over the next four years. The push on infrastructure is helping construction, which grew at an annual pace of more than 3 percent in the second half of 2018. At the same time, changes to social-security contributions and taxation are putting more money in consumers’ pockets, which should help domestic demand. Unemployment figures on Friday showed another drop in the number of jobless. “Slowly but surely, Germany is delivering the boost to government spending that observers have asked for many years,” said Holger Schmieding, chief economist at Berenberg Bank. The argument for less frugality has been espoused by everyone from U.S. President Donald Trump to Nobel laureate Paul Krugman, and with German growth cooling, calls from outside Germany for more have grown louder recently. “There is basically no downside” to more spending, according to Brad Setser, a senior fellow for international economics at the Council on Foreign Relations in New York. 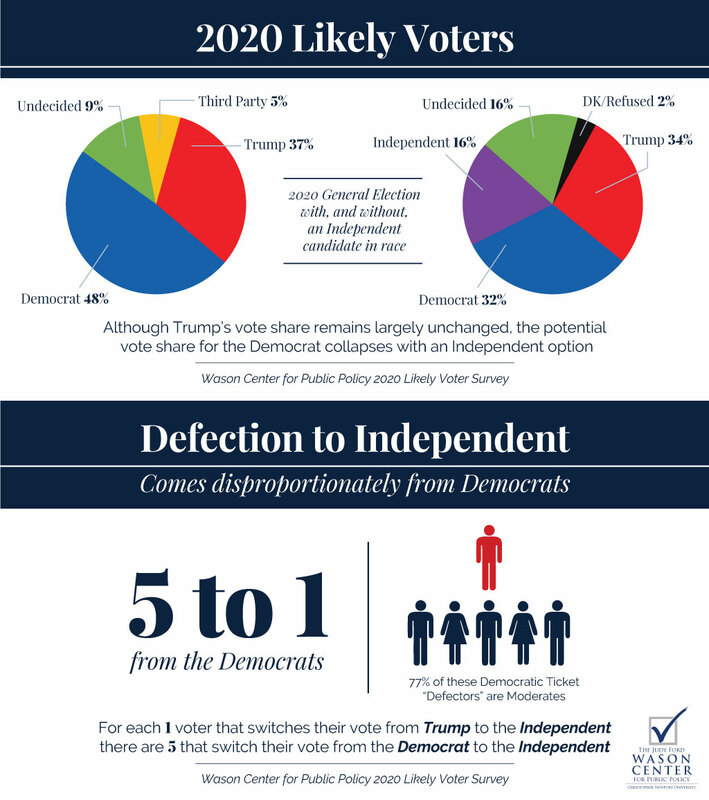 While we have no idea who the Democrats will nominate to be their presidential candidate in 2020, we do know that their policies are likely to be progressive, and call for a high degree of fiscal expansion. In other words, higher deficits. The implementation of MMT would require a higher than usual degree of cooperation and coordination between the fiscal and monetary authorities. Despite Jay Powell’s pushback against MMT in his latest Senate testimony, the ideas are not totally foreign in central banking circles. The enactment of such a program sounds a lot like helicopter money. 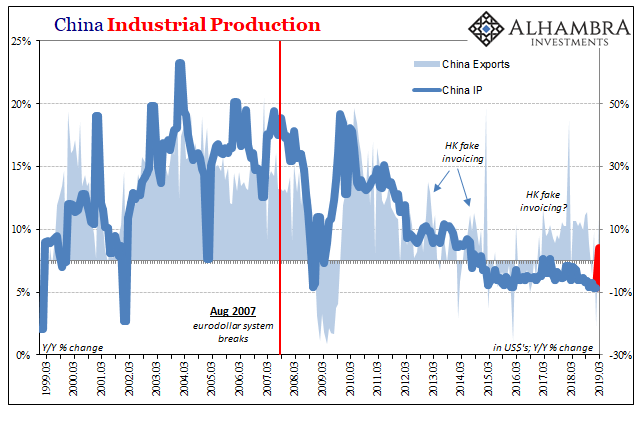 These ideas are also reminiscent of Nomura chief economist Richard Koo’s prescriptions for Japan, which called for the government to spend until it hurts, and then spend some more, while the BoJ supports the fiscal expansion. The only question is who wins the elections in 2020. A victory by the Democrats would see spending in the form of their priorities, namely fighting climate change, free medical care and university education. A Republican victory would see more tax cuts. Either way, we are likely to see more fiscal stimulus. Political scientist Rachel Bitecofer called the scale of the Democrats landslide victory in 2018 well before anyone else. Here is her latest analysis. The Democrats should easily beat Trump in a head-to-head contest, but it becomes a toss-up if an independent like Schulz were to enter the race. That’s because an independent is 5 to 1 times more likely to draw votes from Democrats than from Republicans. In either case, we are likely to see a great MMT experiment in 2021. That will mean fiscal stimulus, which will be reflationary and equity bullish. I have no idea if the implementation of MMT will be a boon, and Kelton will become the Arthur Laffer of the Left. The bill will be payable much later. In the meantime, investors should be prepared to party! If the results were to turn out to be catastrophic, investors can then opportunistically position themselves to profit from the cleanup. A reader recently asked me if I was still tactically bearish. If so, what was my downside objective, and what would turn me bullish. I replied that I would turn bullish if earnings estimates showed a consistent turnaround for two consecutive weeks, and across all market cap bands. 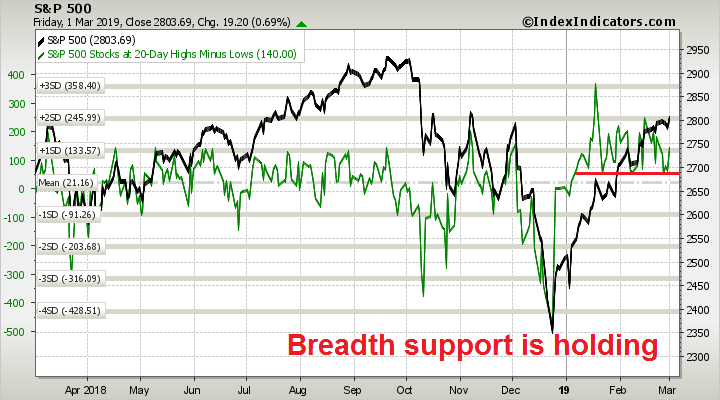 In addition, the recent breadth thrust off the December bottom had been breathtaking, and I would be surprised to see a correction that is more than 5-10%. 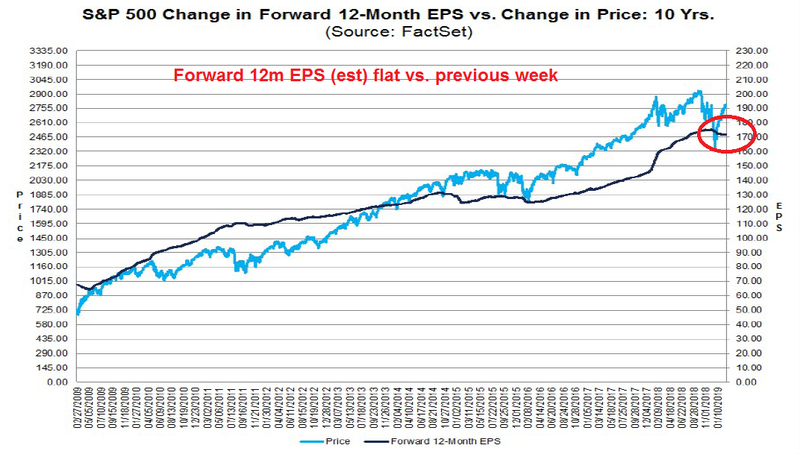 The latest update of earnings estimates from FactSet showed some mixed results. The good news is forward 12-month estimates had stopped falling in the latest week, though in the context of a multi-week downtrend. 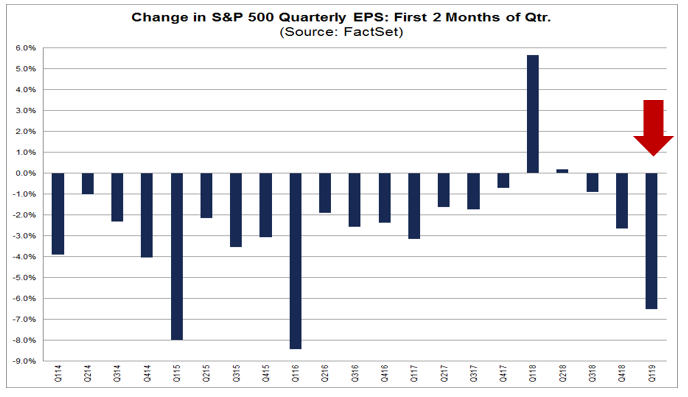 The bad news is the market is experiencing the worst cut in quarterly estimates since Q1 2016. The coincident nowcast is neutral. The short-term forecast is negative. The long-term forecast is neutral, just slightly above negative. By next week the effects of the government shutdown in the weekly data should be gone. The monthly data may be temporarily skewed to the downside in December and January, with a compensating skew to the upside in February. The base case remains a continuing slowdown all this year, with the possibility of recession (due in large part to poor or haphazard public policy) increasing during the second half. The technical outlook is not overly encouraging for the bull case either. The S&P 500 advance failed at a key 2800 resistance level while violating and uptrend line. In addition, the recent rally had been accompanied by a series of “good overbought” conditions as measured by RSI-5, but past rallies had been halted by an overbought signal on RSI-14, which the market flashed in the last couple of weeks. These are all signs of a struggling bull. The picture from market cap leadership is also somewhat disconcerting. Mid and small cap stocks had been the relative strength leaders in the latest advance, and both groups have violated relative uptrends (circled) indicating a loss of momentum. 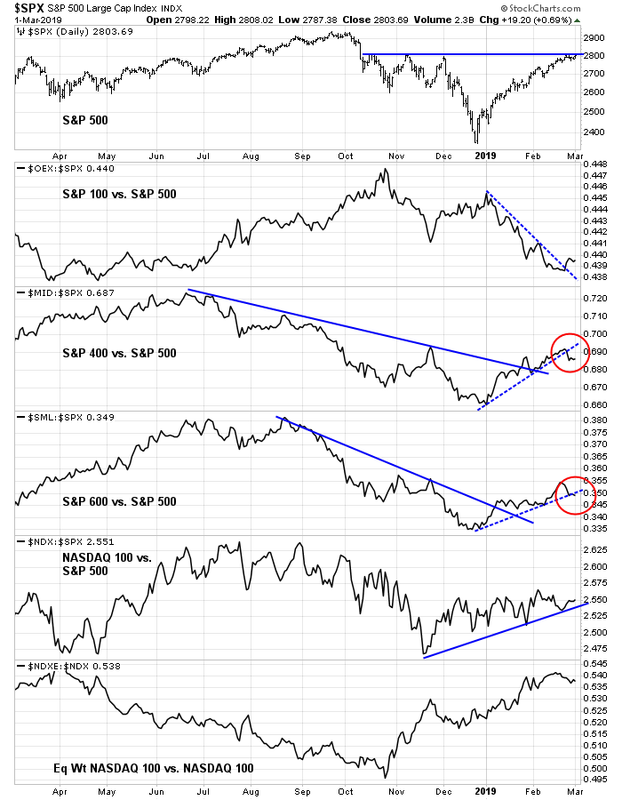 The relative performance of defensive sectors have been behaving in an unusual fashion since the onset of the rally. 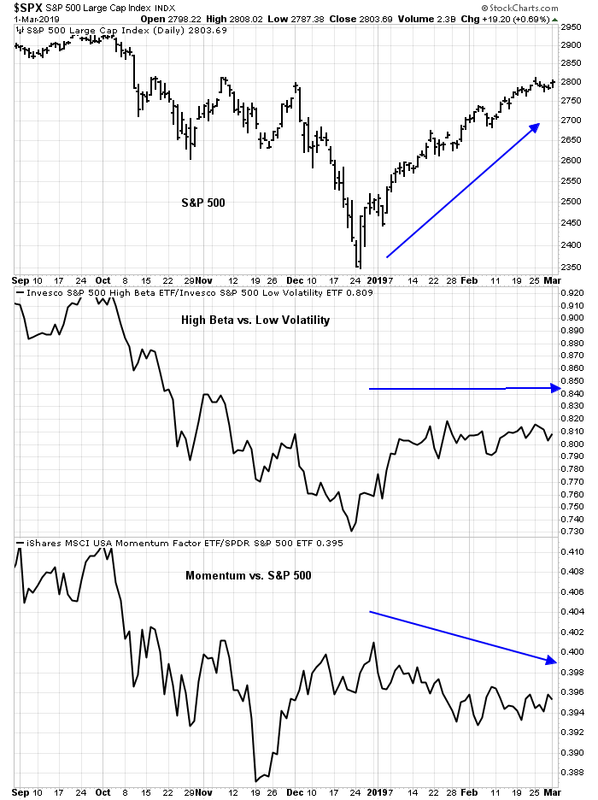 Normally, you would expect defensive stocks to lag as the market undergoes a strong momentum driven V-shaped rally. 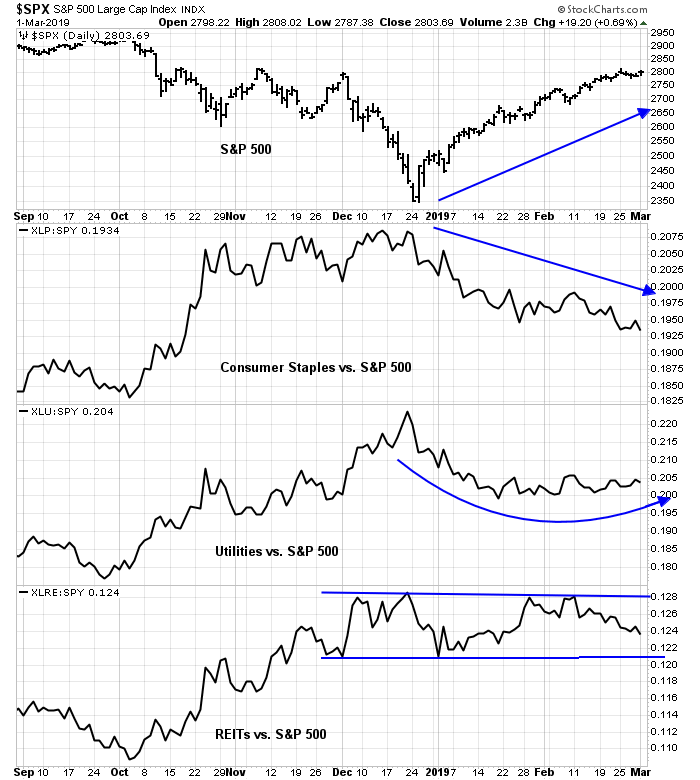 While Consumer Staples stocks have underperformed, which is expected, Utilities are beginning to form a broad based relative bottom, and REITS remain range-bound on a relative basis. It is also a puzzle that high beta flat against low volatility stocks and price momentum slightly negative since the market rally? 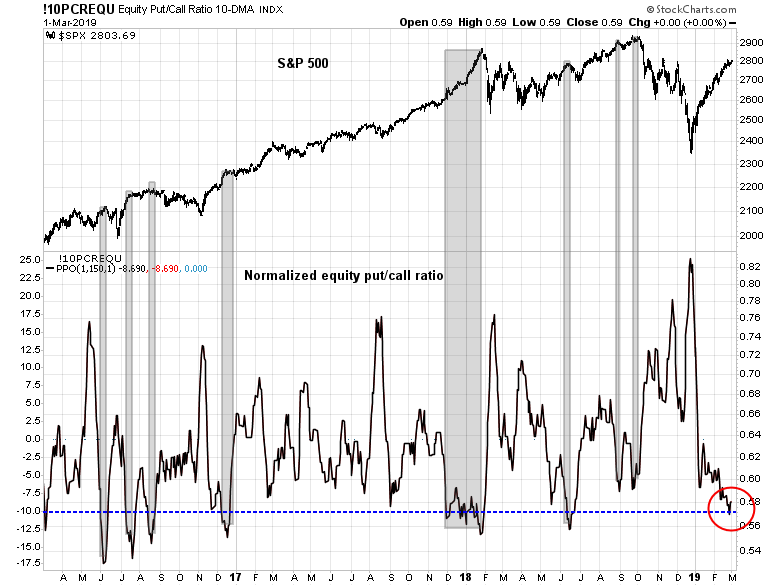 In addition, the long-term normalized equity-only put/call ratio is depressed, indicating a high level of complacency. With the exception of the late 2017 market melt-up, stock prices have either stalled or retreated when readings reached these levels in the past three years. To be sure, the bull case is not entirely dead. Credit market risk appetite indicators are showing no signs of negative divergence and confirming the latest stock market advance. 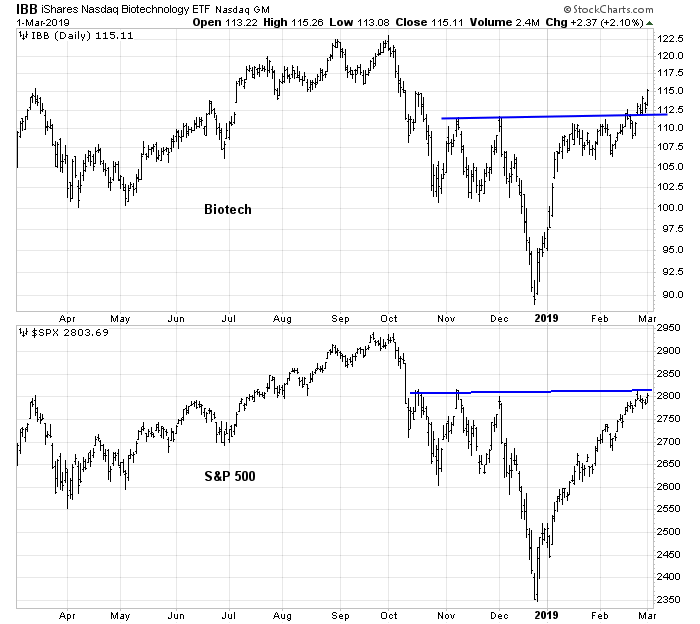 I have also been watching Biotech stocks as a key tactical indicator. These stocks staged an upside breakout through resistance even as the S&P 500 stalled at resistance. So far, Biotechs are holding up well above resistance turned support, which is a bullish sign. I am also monitoring the net 20-day highs-lows as a key tactical indicator. The bulls have so far successfully defended support, while the bears will have to weaken the market sufficiently to break support. Just to be clear, I am not forecasting a bearish scenario where the market corrects back to test its December lows. 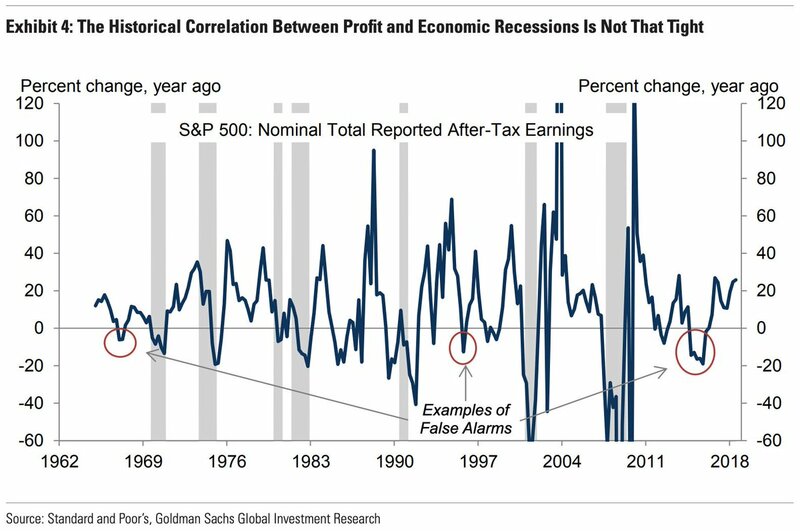 Even if the market were to experience an earnings recession, analysis from Goldman Sachs reveals that 13 of the last 22 earnings recessions were not followed by actual economic recessions, which were the real bull market killers. 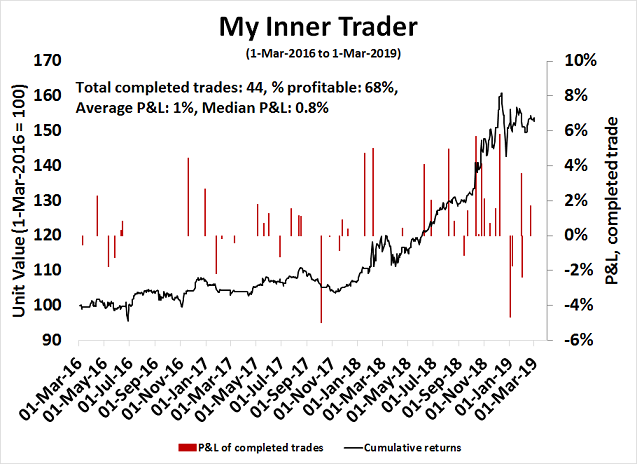 My inner investor has taken partial profits by trimming equity positions that drifted upwards because of the two month market rally, and he is back at a neutral asset allocation. My inner trader continues to lean bearish.